You need a rest day. Now whether they are planned or happen because you sleep through your alarm clock, know that your body NEEDS it. I found this gem of a graphic from FreshCleanFit‘s Tumblr. Check her blog out! 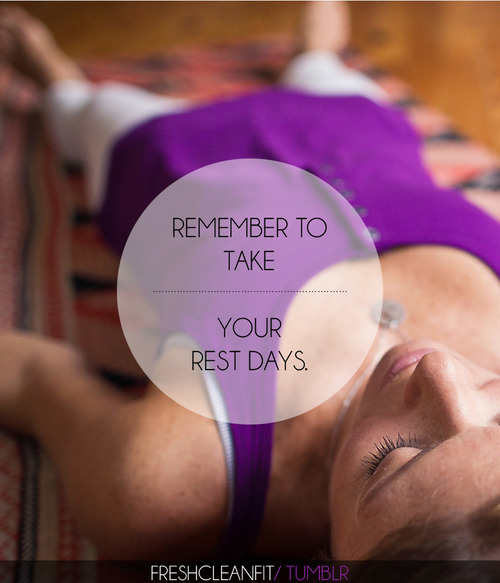 Today’s rest day was unintentionally…but it forced me to remember how important rest days are. Your body cannot take power workouts 7 days a week. You need one rest day in there! Treat yo’ self! This week, my rest day came as a result of the husband and I deciding to go out with our softball team for dinner and drinks at our favorite bar downtown (soaking wet from the rain) after out game. We lost…so many pitchers were ordered. Note to self: drinking even just one beer and eating a burger and then thinking you can get up and go run in the morning does not work. I slept completely through my alarm and was woken up by the noise of said husband making an espresso. It happens! I’ve gotten a few e-mails on pre-workout nutrition lately so keep an eye out for an upcoming blog post. So what does this mean for me in my search to find my strong? 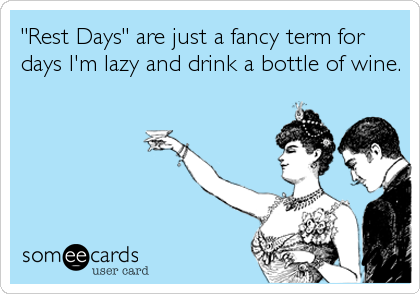 It means I modify my work out plan. I can’t run tonight because of a work event so it means I cannot skip Friday, Saturday, or Sunday. Just one rest day for this girl. I know my body will thank me…but I will still kick myself. We need it right? NextWork it out – finding what works for YOU!